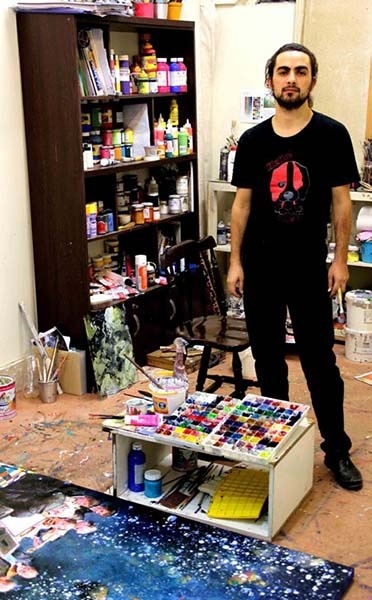 The ‘Eternal Feast’ exhibition in Paris displays a selection of over 20 paintings by Iranian artist Adel Younesi. The exhibition displays a selection of over 20 paintings which were all created in 2014. Hesam Khalatbari and Yasi Metghalchi are the curators of the art exhibition. Iranian painter Adel Younesi usually opts for large dimensions for his paintings. However, in this exhibition, his smaller-sized artworks have been put on display. All paintings presented at the art gallery have been done by acrylic and oil painting techniques. His artworks enjoy a complicated atmosphere and depict a dream-like world. Younesi assembles elements of his paintings like characters of a play in a frame. 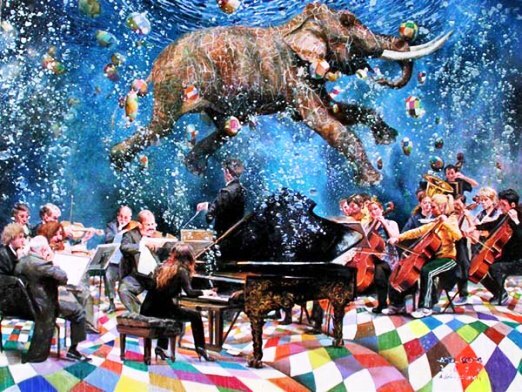 People, dolphins, tigers, zebras, old cars, clowns and well-known figures join in to form a full orchestra performing a musical for the audience, a story which takes place somewhere under the surface of the sea. However, every part of it seems so unfamiliar and astonishing that makes the visitor realize that no happy ending is in store for the world. The ‘Eternal Feast’ exhibition opened on December 2 in Paris and will come to an end on December 9.